Why Would You Use Pointers? Listing 8.4. Allocating, using, and deleting pointers. How to declare and use pointers. What the free store is and how to manipulate memory. Pointers present two special challenges when learning C++: They can be somewhat confusing, and it isn't immediately obvious why they are needed. This chapter explains how pointers work, step by step. You will fully understand the need for pointers, however, only as the book progresses. New Term: A pointer is a variable that holds a memory address. To understand pointers, you must know a little about computer memory. 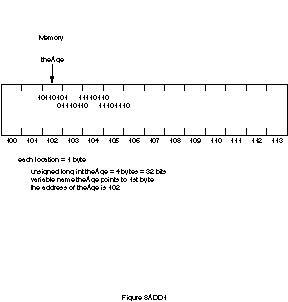 Computer memory is divided into sequentially numbered memory locations. Each variable is located at a unique location in memory, known as its address. (This is discussed in the "Extra Credit" section following Day 5, "Functions.") Figure 8.1 shows a schematic representation of the storage of an unsigned long integer variable theAge. Figure 8.1. A schematic representation of theAge. Different computers number this memory using different, complex schemes. Usually programmers don't need to know the particular address of any given variable, because the compiler handles the details. If you want this information, though, you can use the address of operator (&), which is illustrated in Listing 8.1. Listing 8.1. Demonstrating address of variables. Analysis: Three variables are declared and initialized: a short in line 8, an unsigned long in line 9, and a long in line 10. Their values and addresses are printed in lines 12-16, by using the address of operator (&). The value of shortVar is 5, as expected, and its address is 0x8fc9:fff4 when run on my 80386-based computer. This complicated address is computer-specific and may change slightly each time the program is run. Your results will be different. What doesn't change, however, is that the difference in the first two addresses is two bytes if your computer uses two-byte short integers. The difference between the second and third is four bytes if your computer uses four-byte long integers. Figure 8.2 illustrates how the variables in this program would be stored in memory. Figure 8.2. Illustration of variable storage. There is no reason why you need to know the actual numeric value of the address of each variable. What you care about is that each one has an address and that the right amount of memory is set aside. You tell the compiler how much memory to allow for your variables by declaring the variable type; the compiler automatically assigns an address for it. 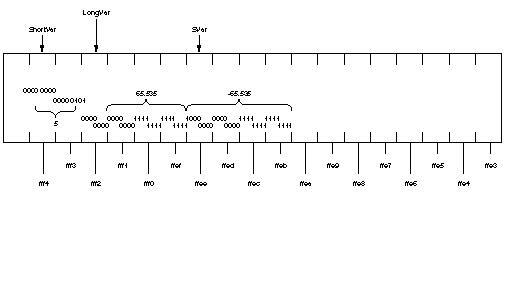 For example, a long integer is typically four bytes, meaning that the variable has an address to four bytes of memory. Every variable has an address. Even without knowing the specific address of a given variable, you can store that address in a pointer. This declares pAge to be a pointer to int. That is, pAge is declared to hold the address of an int. Note that pAge is a variable like any of the variables. When you declare an integer variable (type int), it is set up to hold an integer. When you declare a pointer variable like pAge, it is set up to hold an address. pAge is just a different type of variable. In this example, pAge is initialized to zero. A pointer whose value is zero is called a null pointer. All pointers, when they are created, should be initialized to something. If you don't know what you want to assign to the pointer, assign 0. A pointer that is not initialized is called a wild pointer. Wild pointers are very dangerous. NOTE: Practice safe computing: Initialize your pointers! The first line creates a variable--howOld, whose type is unsigned short int--and initializes it with the value 50. The second line declares pAge to be a pointer to type unsigned short int and initializes it to zero. You know that pAge is a pointer because of the asterisk (*) after the variable type and before the variable name. The third and final line assigns the address of howOld to the pointer pAge. You can tell that the address of howOld is being assigned because of the address of operator (&). If the address of operator had not been used, the value of howOld would have been assigned. That might, or might not, have been a valid address. pAge is a pointer that now contains the address of the howOld variable. Using pAge, you can actually determine the value of howOld, which in this case is 50. Accessing howOld by using the pointer pAge is called indirection because you are indirectly accessing howOld by means of pAge. Later today you will see how to use indirection to access a variable's value. New Term: Indirection means accessing the value at the address held by a pointer. The pointer provides an indirect way to get the value held at that address. Pointers can have any name that is legal for other variables. This book follows the convention of naming all pointers with an initial p, as in pAge or pNumber. The indirection operator (*) is also called the dereference operator. When a pointer is dereferenced, the value at the address stored by the pointer is retrieved. The indirection operator (*) in front of the variable pAge means "the value stored at." This assignment says, "Take the value stored at the address in pAge and assign it to yourAge." When the pointer is dereferenced, the indirection operator indicates that the value at the memory location stored in the pointer is to be accessed, rather than the address itself. Also note that this same character (*) is used as the multiplication operator. The compiler knows which operator to call, based on context. It is important to distinguish between a pointer, the address that the pointer holds, and the value at the address held by the pointer. This is the source of much of the confusion about pointers. 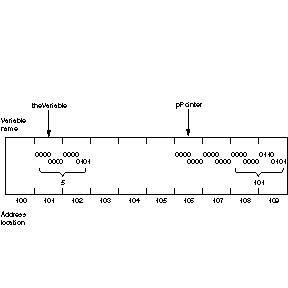 theVariable is declared to be an integer variable initialized with the value 5. pPointer is declared to be a pointer to an integer; it is initialized with the address of theVariable. pPointer is the pointer. The address that pPointer holds is the address of theVariable. The value at the address that pPointer holds is 5. Figure 8.3 shows a schematic representation of theVariable and pPointer. Figure 8.3. A schematic representation of memory. Once a pointer is assigned the address of a variable, you can use that pointer to access the data in that variable. Listing 8.2 demonstrates how the address of a local variable is assigned to a pointer and how the pointer manipulates the values in that variable. Listing 8.2. Manipulating data by using pointers. Analysis: This program declares two variables: an unsigned short, myAge, and a pointer to an unsigned short, pAge. myAge is assigned the value 5 on line 10; this is verified by the printout in line 11. On line 13, pAge is assigned the address of myAge. On line 15, pAge is dereferenced and printed, showing that the value at the address that pAge stores is the 5 stored in myAge. In line 17, the value 7 is assigned to the variable at the address stored in pAge. This sets myAge to 7, and the printouts in lines 21-22 confirm this. In line 27, the value 9 is assigned to the variable myAge. This value is obtained directly in line 29 and indirectly (by dereferencing pAge) in line 30. Pointers enable you to manipulate addresses without ever knowing their real value. After today, you'll take it on faith that when you assign the address of a variable to a pointer, it really has the address of that variable as its value. But just this once, why not check to make sure? Listing 8.3 illustrates this idea. Listing 8.3. Finding out what is stored in pointers. 1:      // Listing 8.3 What is stored in a pointer. Analysis: In line 8, myAge and yourAge are declared to be variables of type unsigned short integer. In line 9, pAge is declared to be a pointer to an unsigned short integer, and it is initialized with the address of the variable myAge. Lines 11 and 12 print the values and the addresses of myAge and yourAge. Line 14 prints the contents of pAge, which is the address of myAge. Line 15 prints the result of dereferencing pAge, which prints the value at pAge--the value in myAge, or 5. This is the essence of pointers. Line 14 shows that pAge stores the address of myAge, and line 15 shows how to get the value stored in myAge by dereferencing the pointer pAge. Make sure that you understand this fully before you go on. Study the code and look at the output. In line 17, pAge is reassigned to point to the address of yourAge. The values and addresses are printed again. The output shows that pAge now has the address of the variable yourAge and that dereferencing obtains the value in yourAge. DO use the indirection operator (*) to access the data stored at the address in a pointer. DO initialize all pointers either to a valid address or to null (0). DO remember the difference between the address in a pointer and the value at that address. Managing data on the free store. Accessing class member data and functions. Passing variables by reference to functions. This rest of this chapter focuses on managing data on the free store and accessing class member data and functions. Tomorrow you will learn about passing variables by reference. Local variables are on the stack, along with function parameters. Code is in code space, of course, and global variables are in global name space. The registers are used for internal housekeeping functions, such as keeping track of the top of the stack and the instruction pointer. Just about all remaining memory is given over to the free store, which is sometimes referred to as the heap. The problem with local variables is that they don't persist: When the function returns, the local variables are thrown away. Global variables solve that problem at the cost of unrestricted access throughout the program, which leads to the creation of code that is difficult to understand and maintain. Putting data in the free store solves both of these problems. You can think of the free store as a massive section of memory in which thousands of sequentially numbered cubbyholes lie waiting for your data. You can't label these cubbyholes, though, as you can with the stack. You must ask for the address of the cubbyhole that you reserve and then stash that address away in a pointer. One way to think about this is with an analogy: A friend gives you the 800 number for Acme Mail Order. You go home and program your telephone with that number, and then you throw away the piece of paper with the number on it. If you push the button, a telephone rings somewhere, and Acme Mail Order answers. You don't remember the number, and you don't know where the other telephone is located, but the button gives you access to Acme Mail Order. Acme Mail Order is your data on the free store. You don't know where it is, but you know how to get to it. You access it by using its address--in this case, the telephone number. You don't have to know that number; you just have to put it into a pointer (the button). The pointer gives you access to your data without bothering you with the details. The stack is cleaned automatically when a function returns. All the local variables go out of scope, and they are removed from the stack. The free store is not cleaned until your program ends, and it is your responsibility to free any memory that you've reserved when you are done with it. The advantage to the free store is that the memory you reserve remains available until you explicitly free it. If you reserve memory on the free store while in a function, the memory is still available when the function returns. The advantage of accessing memory in this way, rather than using global variables, is that only functions with access to the pointer have access to the data. This provides a tightly controlled interface to that data, and it eliminates the problem of one function changing that data in unexpected and unanticipated ways. For this to work, you must be able to create a pointer to an area on the free store and to pass that pointer among functions. The following sections describe how to do this. You allocate memory on the free store in C++ by using the new keyword. new is followed by the type of the object that you want to allocate so that the compiler knows how much memory is required. Therefore, new unsigned short int allocates two bytes in the free store, and new long allocates four. This means, "Put 72 at the value in pPointer," or "Assign the value 72 to the area on the free store to which pPointer points." If new cannot create memory on the free store (memory is, after all, a limited resource) it returns the null pointer. You must check your pointer for null each time you request new memory. WARNING: Each time you allocate memory using the new keyword, you must check to make sure the pointer is not null. When you are finished with your area of memory, you must call delete on the pointer. delete returns the memory to the free store. Remember that the pointer itself--as opposed to the memory to which it points--is a local variable. When the function in which it is declared returns, that pointer goes out of scope and is lost. The memory allocated with new is not freed automatically, however. That memory becomes unavailable--a situation called a memory leak. It's called a memory leak because that memory can't be recovered until the program ends. It is as though the memory has leaked out of your computer. When you delete the pointer, what you are really doing is freeing up the memory whose address is stored in the pointer. You are saying, "Return to the free store the memory that this pointer points to." The pointer is still a pointer, and it can be reassigned. Listing 8.4 demonstrates allocating a variable on the heap, using that variable, and deleting it. Analysis: Line 7 declares and initializes a local variable. Line 8 declares and initializes a pointer with the address of the local variable. Line 9 declares another pointer but initializes it with the result obtained from calling new int. This allocates space on the free store for an int. Line 10 verifies that memory was allocated and the pointer is valid (not null). If no memory can be allocated, the pointer is null and an error message is printed. To keep things simple, this error checking often won't be reproduced in future programs, but you must include some sort of error checking in your own programs. Line 15 assigns the value 7 to the newly allocated memory. Line 16 prints the value of the local variable, and line 17 prints the value pointed to by pLocal. As expected, these are the same. Line 19 prints the value pointed to by pHeap. It shows that the value assigned in line 15 is, in fact, accessible. In line 19, the memory allocated in line 9 is returned to the free store by a call to delete. This frees the memory and disassociates the pointer from that memory. pHeap is now free to point to other memory. It is reassigned in lines 20 and 26, and line 27 prints the result. Line 28 restores that memory to the free store. Although line 28 is redundant (the end of the program would have returned that memory) it is a good idea to free this memory explicitly. If the program changes or is extended, it will be beneficial that this step was already taken care of. Line 1 creates pPointer and assigns it the address of an area on the free store. Line 2 stores the value 72 in that area of memory. Line 3 reassigns pPointer to another area of memory. Line 4 places the value 84 in that area. The original area--in which the value 72 is now held--is unavailable because the pointer to that area of memory has been reassigned. There is no way to access that original area of memory, nor is there any way to free it before the program ends. Now the memory originally pointed to by pPointer is deleted, and thus freed, in line 3. NOTE: For every time in your program that you call new, there should be a call to delete. It is important to keep track of which pointer owns an area of memory and to ensure that the memory is returned to the free store when you are done with it. This calls the default constructor--the constructor that takes no parameters. The constructor is called whenever an object is created (on the stack or on the free store). When you call delete on a pointer to an object on the free store, that object's destructor is called before the memory is released. This gives your class a chance to clean up, just as it does for objects destroyed on the stack. Listing 8.5 illustrates creating and deleting objects on the free store. Listing 8.5. Creating and deleting objects on the free store. SimpleCat *pRags = new SimpleCat.. Analysis: Lines 6-13 declare the stripped-down class SimpleCat. Line 9 declares SimpleCat's constructor, and lines 15-19 contain its definition. Line 10 declares SimpleCat's destructor, and lines 21-24 contain its definition. In line 29, Frisky is created on the stack, which causes the constructor to be called. In line 31, the SimpleCat pointed to by pRags is created on the heap; the constructor is called again. In line 33, delete is called on pRags, and the destructor is called. When the function ends, Frisky goes out of scope, and the destructor is called. Listing 8.6. Accessing member data of objects on the free store. One or more of the data members of a class can be a pointer to an object on the free store. The memory can be allocated in the class constructor or in one of its methods, and it can be deleted in its destructor, as Listing 8.7 illustrates. Listing 8.7. Pointers as member data. Analysis: The class SimpleCat is declared to have two member variables--both of which are pointers to integers--on lines 14 and 15. The constructor (lines 22-26) initializes the pointers to memory on the free store and to the default values. The destructor (lines 28-32) cleans up the allocated memory. Because this is the destructor, there is no point in assigning these pointers to null, as they will no longer be accessible. This is one of the safe places to break the rule that deleted pointers should be assigned to null, although following the rule doesn't hurt. The calling function (in this case, main()) is unaware that itsAge and itsWeight are point-ers to memory on the free store. main() continues to call GetAge() and SetAge(), and the details of the memory management are hidden in the implementation of the class--as they should be. When Frisky is deleted in line 40, its destructor is called. The destructor deletes each of its member pointers. If these, in turn, point to objects of other user-defined classes, their destructors are called as well. Every class member function has a hidden parameter: the this pointer. this points to the individual object. Therefore, in each call to GetAge() or SetAge(), the this pointer for the object is included as a hidden parameter. It is possible to use the this pointer explicitly, as Listing 8.8 illustrates. Listing 8.8. Using the this pointer. Output: theRect is 10 feet long. theRect is 5 feet long. theRect is 20 feet long. theRect is 10 feet long. Analysis: The SetLength() and GetLength() accessor functions explicitly use the this pointer to access the member variables of the Rectangle object. The SetWidth and GetWidth accessors do not. There is no difference in their behavior, although the syntax is easier to understand. If that were all there was to the this pointer, there would be little point in bothering you with it. The this pointer, however, is a pointer; it stores the memory address of an object. As such, it can be a powerful tool. You'll see a practical use for the this pointer on Day 10, "Advanced Functions," when operator overloading is discussed. For now, your goal is to know about the this pointer and to understand what it is: a pointer to the object itself. You don't have to worry about creating or deleting the this pointer. The compiler takes care of that. One source of bugs that are nasty and difficult to find is stray pointers. A stray pointer is created when you call delete on a pointer--thereby freeing the memory that it points to--and later try to use that pointer again without reassigning it. It is as though the Acme Mail Order company moved away, and you still pressed the programmed button on your phone. It is possible that nothing terrible happens--a telephone rings in a deserted warehouse. Perhaps the telephone number has been reassigned to a munitions factory, and your call detonates an explosive and blows up your whole city! In short, be careful not to use a pointer after you have called delete on it. The pointer still points to the old area of memory, but the compiler is free to put other data there; using the pointer can cause your program to crash. Worse, your program might proceed merrily on its way and crash several minutes later. This is called a time bomb, and it is no fun. To be safe, after you delete a pointer, set it to null (0). This disarms the pointer. NOTE: Stray pointers are often called wild pointers or dangling pointers. Listing 8.9 illustrates creating a stray pointer. WARNING: This program intentionally creates a stray pointer. Do NOT run this program--it will crash, if you are lucky. Listing 8.9. Creating a stray pointer. 17:       *pInt = 20;      // uh oh, this was deleted! Analysis: Line 8 declares pInt to be a pointer to USHORT, and pInt is pointed to newly allocated memory. Line 9 puts the value 10 in that memory, and line 10 prints its value. After the value is printed, delete is called on the pointer. pInt is now a stray, or dangling, pointer. Line 13 declares a new pointer, pLong, which is pointed at the memory allocated by new. Line 14 assigns the value 90000 to pLong, and line 15 prints its value. Line 17 assigns the value 20 to the memory that pInt points to, but pInt no longer points anywhere that is valid. The memory that pInt points to was freed by the call to delete, so assigning a value to that memory is certain disaster. 1. How could pLong's value change, given that pLong wasn't touched? 2. Where did the 20 go when pInt was used in line 17? As you might guess, these are related questions. When a value was placed at pInt in line 17, the compiler happily placed the value 20 at the memory location that pInt previously pointed to. However, because that memory was freed in line 11, the compiler was free to reassign it. When pLong was created in line 13, it was given pInt's old memory location. (On some computers this may not happen, depending on where in memory these values are stored.) When the value 20 was assigned to the location that pInt previously pointed to, it wrote over the value pointed to by pLong. This is called "stomping on a pointer." It is often the unfortunate outcome of using a stray pointer. This is a particularly nasty bug, because the value that changed wasn't associated with the stray pointer. The change to the value at pLong was a side effect of the misuse of pInt. In a large program, this would be very difficult to track down. 1. pInt was pointed at a particular memory location, and the value 10 was assigned. 2. delete was called on pInt, which told the compiler that it could put something else at that location. Then pLong was assigned the same memory location. 3. The value 90000 was assigned to *pLong. The particular computer used in this example stored the four-byte value of 90,000 (00 01 5F 90) in byte-swapped order. Therefore, it was stored as 5F 90 00 01. 4. pInt was assigned the value 20--or 00 14 in hexadecimal notation. Because pInt still pointed to the same address, the first two bytes of pLong were overwritten, leaving 00 14 00 01. 5. The value at pLong was printed, reversing the bytes back to their correct order of 00 01 00 14, which was translated into the DOS value of 65556. DO use new to create objects on the free store. DO use delete to destroy objects on the free store and to return their memory. DON'T forget to balance all new statements with a delete statement. DON'T forget to assign null (0) to all pointers that you call delete on. DO check the value returned by new. pOne is a pointer to a constant integer. The value that is pointed to can't be changed. pTwo is a constant pointer to an integer. The integer can be changed, but pTwo can't point to anything else. pThree is a constant pointer to a constant integer. The value that is pointed to can't be changed, and pThree can't be changed to point to anything else. The trick to keeping this straight is to look to the right of the keyword const to find out what is being declared constant. If the type is to the right of the keyword, it is the value that is constant. If the variable is to the right of the keyword const, it is the pointer variable itself that is constant. On Day 6, "Basic Classes," you learned that you can apply the keyword const to a member function. When a function is declared const, the compiler flags as an error any attempt to change data in the object from within that function. If you declare a pointer to a const object, the only methods that you can call with that pointer are const methods. Listing 8.10 illustrates this. Listing 8.10. Using pointers to const objects. Analysis: Lines 6-20 declare Rectangle. Line 15 declares the GetWidth() member method const. Line 32 declares a pointer to Rectangle. Line 33 declares pConstRect, which is a pointer to a constant Rectangle. Line 34 declares pConstPtr, which is a constant pointer to Rectangle. Lines 36-38 print their values. In line 40, pRect is used to set the width of the rectangle to 10. In line 41, pConstRect would be used, but it was declared to point to a constant Rectangle. Therefore, it cannot legally call a non-const member function; it is commented out. In line 38, pConstPtr calls SetAge(). pConstPtr is declared to be a constant pointer to a rectangle. In other words, the pointer is constant and cannot point to anything else, but the rectangle is not constant. When you declare an object to be const, you are in effect declaring that the this pointer is a pointer to a const object. A const this pointer can be used only with const mem- ber functions. Constant objects and constant pointers will be discussed again tomorrow, when references to constant objects are discussed. DO protect objects passed by reference with const if they should not be changed. DO pass by reference when the object can be changed. DO pass by value when small objects should not be changed. Pointers provide a powerful way to access data by indirection. Every variable has an address, which can be obtained using the address of operator (&). The address can be stored in a pointer. Pointers are declared by writing the type of object that they point to, followed by the indirection operator (*) and the name of the pointer. Pointers should be initialized to point to an object or to null (0). You access the value at the address stored in a pointer by using the indirection operator (*). You can declare const pointers, which can't be reassigned to point to other objects, and pointers to const objects, which can't be used to change the objects to which they point. To create new objects on the free store, you use the new keyword and assign the address that is returned to a pointer. You free that memory by calling the delete keyword on the pointer. delete frees the memory, but it doesn't destroy the pointer. Therefore, you must reassign the pointer after its memory has been freed. Q. Why are pointers so important? A. Today you saw how pointers are used to hold the address of objects on the free store and how they are used to pass arguments by reference. In addition, on Day 13, "Polymorphism," you'll see how pointers are used in class polymorphism. Q. Why should I bother to declare anything on the free store? A. Objects on the free store persist after the return of a function. Additionally, the ability to store objects on the free store enables you to decide at runtime how many objects you need, instead of having to declare this in advance. This is explored in greater depth tomorrow. Q. Why should I declare an object const if it limits what I can do with it? A. As a programmer, you want to enlist the compiler in helping you find bugs. One serious bug that is difficult to find is a function that changes an object in ways that aren't obvious to the calling function. Declaring an object const prevents such changes. 5. What is the difference between the indirection operator and the address of operator?